The 1992–93 NBA season was the 47th season of the National Basketball Association. The season ended with the Chicago Bulls winning their third-straight NBA Championship, beating the Phoenix Suns 4 games to 2 in the NBA Finals. The 1993–94 NBA season was the Houston Rockets' 27th season in the National Basketball Association, and their 23rd season in Houston. During the offseason, the Rockets acquired Mario Elie from the Portland Trail Blazers. The Rockets went off to a great start, winning their first fifteen games to tie the 1948–49 Washington Capitols for the best unbeaten record to open a season, before the Golden State Warriors surpassed it in 2015. After losing to the Atlanta Hawks on December 3, the Rockets won the next seven games as well, falling just one victory shy of tying the 1969–70 Knicks (23–1) for the best record with one defeat in NBA history. However, the Rockets would cool off as the season progressed, at one point losing four games in a row. Still, they finished first place in the Midwest Division with a 58–24 record, a franchise record that stood until the 2017-18 team recorded their 59th win. In the playoffs, the Rockets defeated the Portland Trail Blazers 3–1 in the first round, then defeated the Phoenix Suns 4–3 in the semifinals, and the 5th-seeded Utah Jazz 4–1 in the Western Conference Finals. In the 1994 NBA Finals, they defeated the New York Knicks in seven games, and won their first championship in franchise history. It was the Rockets' third NBA finals appearance, after 1981 and 1986. Olajuwon was the only player of the 1985–86 Rockets to still be on the 1993–94 team. The Rockets also became the first team from the Midwest Division since the Milwaukee Bucks 23 years prior to win the NBA title. The 1994 NBA Finals was the championship round of the National Basketball Association (NBA)'s 1993–94 season, and the culmination of the season's playoffs. The Western Conference champion Houston Rockets played the Eastern Conference champion New York Knicks for the championship, with the Rockets holding home-court advantage in the best-of-seven series. The Rockets defeated the Knicks 4 games to 3 to win the team's first NBA championship. In Game 6, however, Rockets center Hakeem Olajuwon blocked a last-second championship-winning shot attempt by John Starks, giving the Rockets an 86–84 victory and forcing a Game 7, which made Knicks Coach Pat Riley the first (and to this date, the only) coach in a Game 7 NBA Finals on two teams, having been with the Los Angeles Lakers in 1984 and 1988. In addition, the Knicks set a record for most playoff games played in one season, with 25. The Detroit Pistons tied this record in 2005. The Boston Celtics, coached by Doc Rivers, would surpass it during their championship season of 2008 when they played 26.The Rockets beat the Knicks in Game 7, 90–84, enabling the city of Houston to not only celebrate its first NBA and fifth professional sports championship (first in an existing league), but also deny New York from having both NBA and NHL championships in the same year (Chicago had suffered this fate two years earlier in 1992, with the Bulls winning their second NBA championship and the Blackhawks losing in the Stanley Cup Finals). For his efforts Olajuwon was named NBA Finals Most Valuable Player. For the Knicks, Riley had the unfortunate distinction of having become the first (and to this date, the only) coach to lose a Game 7 NBA Finals on two teams, having lost to the Celtics in 1984. It also denied him the distinction of being the first coach to win a Game 7 NBA Finals with two teams, having defeated the Detroit Pistons in 1988. The 1994–95 NBA season was the Rockets' 28th season in the National Basketball Association, and 24th season in Houston. After winning their first championship, the Rockets went on to win their first nine games of the season. However, with increased competition in the West, management felt a change was needed to win another title. 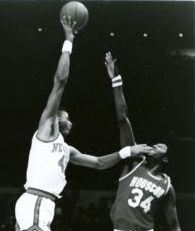 On February 14, the Rockets traded Otis Thorpe to the Portland Trail Blazers for All-Star guard Clyde Drexler, a former teammate of Hakeem Olajuwon at the University of Houston. However, after the trade, the Rockets struggled in the second half of the season posting a record of 17–18 on their way to finishing third in the Midwest Division with a 47–35 record. Olajuwon was selected for the 1995 NBA All-Star Game. In the playoffs, the Rockets faced the 3rd-seeded Utah Jazz in the first round. The Jazz would take a 2–1 series lead, but the Rockets went on to win the series in five games. In the semifinals, they faced the Phoenix Suns for the second consecutive year. The Rockets managed to defeat the 2nd-seeded Suns in seven games to advance to the Western Conference Finals. In the all Texas Western Conference, they faced the top-seeded San Antonio Spurs. Both teams lacked home court advantage in the series, only winning on the road until the Rockets won Game 6 at The Summit and advanced to the NBA Finals. In the Finals, they swept the Orlando Magic in four straight games, and won their second consecutive championship. Following the season, Vernon Maxwell signed as a free agent with the Philadelphia 76ers, and Tracy Murray left in the 1995 NBA Expansion Draft. The 2001–02 NBA season was the Raptors' 7th season in the National Basketball Association. During the offseason, the Raptors acquired All-Star center and 2-time NBA Champion Hakeem Olajuwon from the Houston Rockets. Throughout the season, All-Star guard Vince Carter struggled with a left knee injury, and only managed to play 60 games. Despite the injury, Carter was still voted to play in the All-Star Game for the third consecutive year, but he did not play due to injury. The Raptors played solid basketball with a 29–21 start 50 games into the season. However, the team then suffered a 13-game losing streak, losing 17 of their next 18 games. They would then post a nine-game winning streak between March and April. Despite losing their team captain for the rest of the season and the playoffs, the Raptors finished with a 42–40 record, and finished third place in the Central Division, which allowed them to clinch a playoff spot behind the efforts of their other team captain Antonio Davis. Toronto's season ended in the first round with a heartbreaking defeat to the Detroit Pistons in five hard-fought games. Following the season, Chris Childs re-signed as a free agent with the New Jersey Nets, Keon Clark signed with the Sacramento Kings, Tracy Murray was traded to the Los Angeles Lakers, and Olajuwon and Dell Curry both retired. In basketball, an assist is attributed to a player who passes the ball to a teammate in a way that leads to a score by field goal, meaning that he or she was "assisting" in the basket. There is some judgment involved in deciding whether a passer should be credited with an assist. An assist can be scored for the passer even if the player who receives the pass makes a basket after dribbling the ball. However, the original definition of an assist did not include such situations, so the comparison of assist statistics across eras is a complex matter. Only the pass directly before the score may be counted as an assist, so no more than one assist can be recorded per field goal (unlike in other sports, such as ice hockey). A pass that leads to a shooting foul and scoring by free throws does not count as an assist in the NBA, but does in FIBA play (only one assist is awarded per set of free throws in which at least one free throw is made). Point guards tend to get the most assists per game (apg), as their role is primarily that of a passer and ballhandler. Centers tend to get fewer assists, but centers with good floor presence and court vision can dominate a team by assisting. Being inside the key, the center often has the best angles and the best position for "dishes" and other short passes in the scoring area. Center Wilt Chamberlain led the NBA in assists in 1968. A strong center with inside-scoring prowess, such as former NBA center Hakeem Olajuwon, can also be an effective assistor because the defense's double-teaming tends to open up offense in the form of shooters. The NBA single-game assist team record is 53, held by the Milwaukee Bucks, on December 26, 1978. The NBA single-game assist individual record is 30, held by Scott Skiles of the Orlando Magic on December 30, 1990. The NBA record for most career assists is held by John Stockton, with 15,806, Stockton also holds the NBA single season assist per game record with 14.5 during the 1989-1990 regular season. The highest career assist per game average in NBA history is held by Magic Johnson, with 11.2 assist per game. FIBA Africa Clubs Champions Cup. The NBA is investing millions to increase a foothold in the African market. Hakeem Olajuwon is considered instrumental in developing and popularizing Basketball in Africa. The Best NBA Player ESPY Award is an award presented annually since 1993 to a National Basketball Association (NBA) player adjudged to be the best in a given year, typically the NBA season contested during or immediately before the holding of the ESPY Awards ceremony. Between 1993 and 2004, the award voting panel comprised variously fans; sportswriters and broadcasters, sports executives, and retired sportspersons, termed collectively experts; and retired sportspersons, but balloting thereafter has been exclusively by fans over the Internet from amongst choices selected by the ESPN Select Nominating Committee. Through the 2001 iteration of the ESPY Awards, ceremonies were conducted in February of each year to honor achievements over the previous calendar year; awards presented thereafter are conferred in June and reflect performance from the June previous. Six players have won the award more than once; Michael Jordan won the inaugural award and a total of four across his career. LeBron James has won the award a total of seven times, the most by any player, while Kobe Bryant, Tim Duncan, Hakeem Olajuwon, and Shaquille O'Neal have claimed two each. The Bill Russell NBA Finals Most Valuable Player Award (formerly known as the NBA Finals Most Valuable Player Award) is an annual National Basketball Association (NBA) award given since the 1969 NBA Finals. The award is decided by a panel of eleven media members, who cast votes after the conclusion of the Finals. The person with the highest number of votes wins the award. The award was originally a black trophy with a gold basketball-shaped sphere at the top, similar to the Larry O'Brien Trophy, until a new trophy was introduced in 2005 to commemorate Bill Russell.Since its inception, the award has been given to 31 players. Michael Jordan is a record six-time award winner. Magic Johnson, Shaquille O'Neal, Tim Duncan and LeBron James won the award three times in their careers. Jordan and O'Neal are the only players to win the award in three consecutive seasons (Jordan accomplished the feat on two separate occasions). Johnson is the only rookie ever to win the award, as well as the youngest at 20 years old. Andre Iguodala is the only winner to have not started every game in the series. Jerry West, the first ever awardee, is the only person to win the award while being on the losing team in the NBA Finals. Willis Reed, Kareem Abdul-Jabbar, Larry Bird, Hakeem Olajuwon, Kobe Bryant, and Kevin Durant won the award twice. Olajuwon, Durant, Bryant, and James have won the award in two consecutive seasons. Abdul-Jabbar and James are the only players to win the award for two teams. Olajuwon of Nigeria, who became a naturalized U.S. citizen in 1993, Tony Parker of France, and Dirk Nowitzki of Germany are the only international players to win the award. Duncan is an American citizen, but is considered an "international" player by the NBA because he was not born in one of the fifty states or Washington, D.C. Parker and Nowitzki are the only winners to have been trained totally outside the U.S.; Olajuwon played college basketball at Houston and Duncan at Wake Forest. Cedric Maxwell is the only Finals MVP winner eligible for the Hall of Fame who has not been voted in.On February 14, 2009, during the 2009 NBA All-Star Weekend in Phoenix, then-NBA Commissioner David Stern announced that the award would be renamed the "Bill Russell NBA Finals Most Valuable Player Award" in honor of 11-time NBA champion Bill Russell. A fadeaway or fall-away in basketball is a jump shot taken while jumping backwards, away from the basket. The goal is to create space between the shooter and the defender, making the shot much harder to block. The shooter must have very good accuracy (much higher than when releasing a regular jump shot) and must use more strength (to counteract the backwards momentum) in a relatively short amount of time. Also, because the movement is away from the basket, the shooter has less chance to grab his own rebound. The shooting percentage is lower in fadeway (because of the difficulty of the shot) and the shooter cannot get his own rebound. This leads many coaches and players to believe it is one of the worst shots in the game to take. However, once mastered, it is one of the hardest methods of shooting for defenders to block. The threat of a fadeaway forces a defender to jump into the shooter, and with a pump fake, the shooter can easily get a foul on the defender. Only a handful of great NBA players have been successful shooting fadeaways. Michael Jordan was one of the most popular shooters of the fadeaway. Wilt Chamberlain, Patrick Ewing, LeBron James, Kobe Bryant, Hakeem Olajuwon, Dwyane Wade, Karl Malone, Larry Bird, Carmelo Anthony, DeMar DeRozan, and LaMarcus Aldridge are also well known for using this move. The even more difficult one-legged fadeaway has become Dirk Nowitzki's signature move and has been called by LeBron James the second most unstoppable move ever, only behind Kareem Abdul-Jabbar's skyhook. The Houston Rockets are an American professional basketball team based in Houston, Texas. The Rockets compete in the National Basketball Association (NBA), as a member of the league's Western Conference Southwest Division. The Rockets are one of three NBA teams based in Texas. The team plays its home games at the Toyota Center, located in downtown Houston. The Rockets have won two consecutive NBA championships and four Western Conference titles. The team was established as the San Diego Rockets, an expansion team originally based in San Diego, in 1967. In 1971, the Rockets moved to Houston. The Rockets won only 15 games in their debut season as a franchise in 1967. In the 1968 NBA draft, the Rockets selected power forward Elvin Hayes first overall. Led by Hayes, the team made its first playoff appearance in his rookie season. The Rockets did not finish a season with a winning record until the 1976–77 season, when they traded for all-star center Moses Malone. Malone went on to win the NBA Most Valuable Player (MVP) award twice and led Houston to the conference finals in his first year with the team. He also led the Rockets to the NBA Finals in 1981 where they were defeated in six games by the Boston Celtics, led by Larry Bird and future Rockets coach Kevin McHale. In the 1984 NBA draft, the Rockets drafted center Hakeem Olajuwon, who would be paired with 7 feet 4 inches (2.24 m) Ralph Sampson, forming one of the tallest front courts in the NBA. Nicknamed the "Twin Towers", they led the team to the 1986 NBA Finals—the second NBA Finals appearance in franchise history—where Houston was again defeated by the 67-win Boston Celtics. The Rockets continued to reach the playoffs throughout the 1980s, but failed to advance past the first round for several years following a second-round defeat to the Seattle SuperSonics in 1987. Former Rockets forward Rudy Tomjanovich took over as head coach midway through the 1991–92 season, ushering in the most successful period in franchise history. The Olajuwon-led Rockets went to the 1994 NBA Finals and won the franchise's first championship against Patrick Ewing and the New York Knicks. The following season, reinforced by another all-Star, Clyde Drexler, the Rockets repeated as champions with a four-game sweep of the Orlando Magic, who were led by a young duo of Shaquille O'Neal and Penny Hardaway. Houston, which was seeded sixth in the Western Conference during the 1995 playoffs, became the lowest-seeded team in NBA history to win the title. The Rockets acquired all-star forward Charles Barkley in 1996, but the presence of three of the NBA's 50 greatest players of all-time (Olajuwon, Drexler, and Barkley) was not enough to propel Houston past the Western Conference Finals. In 1998, the Rockets acquired all-star Scottie Pippen, though like Barkley, his superstar presence would prove not enough for the Rockets to make a serious playoff push. Each one of the aging all-stars had left the team by 2001. The Rockets looked to return to serious playoff contention in the mid-2000s, led by superstar pair Yao Ming and Tracy McGrady, although the next several seasons would be followed by the trend of consistent regular season respectability followed by playoff underachievement, failing to advance past the first round, as both players struggled with injuries. After Yao's early retirement in 2011, the Rockets entered a period of rebuilding, completely dismantling and retooling their roster. The acquisition of franchise player James Harden in 2012 has launched the Rockets back into championship contention in the mid-2010s. The Houston Rockets are an American professional basketball franchise based in Houston, Texas. The team plays in the Southwest Division of the Western Conference in the National Basketball Association (NBA). The team was established in 1967, and played in San Diego, California for four years, before relocating to Houston. They have made the playoffs in 25 of their 42 seasons, and won their division and conference four times each; they also won back-to-back NBA championships in 1994 and 1995. They won 22 straight games during the 2007–08 season, the third-longest streak in NBA history.Hakeem Olajuwon, the NBA Finals Most Valuable Player in both of the Rockets' championship seasons, played for the Rockets for 17 years, and is the career leader for the franchise in 9 categories. He also holds the NBA records for blocks in a playoff game, and most points and blocks in a 4-game playoff series. Moses Malone, who played 6 of 19 seasons for the Rockets, had the most points, rebounds, and free throws made in a season for the Rockets, and he also holds the NBA records for most offensive rebounds in a regular season and playoff game. The individual player records section lists the Rockets career leaders in major statistical categories, as well as franchise records for single seasons and games. The team section lists the Rockets' teams that have recorded the highest and lowest totals in a category in a single season and game, and any NBA records that the Rockets have set as a team. This is a complete list of National Basketball Association players who have blocked 10 or more shots in a game. 44 different players have blocked 10 or more shots in a game. It has occurred a total of 159 times (including the playoffs) in NBA history. Mark Eaton accomplished the feat more times than anyone else in league history (19), followed by Manute Bol (18). Eaton, Hakeem Olajuwon, and Andrew Bynum are the only players to block 10 or more shots in a playoff game, with Bynum being the only player to do so with a victory. The NBA did not record blocked shots until the 1973–74 season. Unofficially, Wilt Chamberlain blocked 23 shots for the LA Lakers in a game against the Phoenix Suns on December 25, 1968 and is reported by NBA historian Harvey Pollack to have blocked 25 shots in a playoff game against the Detroit Pistons. The National Basketball Association's first overall pick is the player who is selected first among all eligible draftees by a team during the annual National Basketball Association (NBA) draft. The first pick is awarded to the team that wins the NBA draft lottery; in most cases, that team had a losing record in the previous season. The team with the first pick attracts significant media attention, as does the player who is selected with that pick. Eleven first picks have won the NBA Most Valuable Player Award: Oscar Robertson, Kareem Abdul-Jabbar (record six-time winner), Bill Walton, Magic Johnson (three-time winner), Hakeem Olajuwon, David Robinson, Shaquille O'Neal, Allen Iverson, Tim Duncan (two-time winner), LeBron James (four-time winner), and Derrick Rose (youngest winner). Since the advent of the draft lottery in 1985, seven number one overall picks have won an NBA title. They are David Robinson, Shaquille O'Neal, Glenn Robinson, Tim Duncan, LeBron James, Andrew Bogut, and Kyrie Irving. China's Yao Ming (2002) and Italy's Andrea Bargnani (2006) are the only two players without competitive experience in the United States to be drafted first overall. Eleven other international players with U.S. college experience have been drafted first overall—Mychal Thompson (Bahamas) in 1978, Hakeem Olajuwon (Nigeria) in 1984, Patrick Ewing (Jamaica) in 1985, Tim Duncan (U.S. Virgin Islands) in 1997, Michael Olowokandi (Nigeria) in 1998, Andrew Bogut (Australia) in 2005, Kyrie Irving (Australia) in 2011, Anthony Bennett (Canada) in 2013, Andrew Wiggins (Canada) in 2014, Ben Simmons (Australia) in 2016, and Deandre Ayton (Bahamas) in 2018. Duncan is an American citizen, but is considered an "international" player by the NBA because he was not born in one of the fifty states or the District of Columbia. Ewing had dual Jamaican-American citizenship when he was drafted and Irving and Simmons had dual Australian-American citizenship when they were drafted. Note that the drafts between 1947 and 1949 were held by the Basketball Association of America (BAA). The Basketball Association of America became the National Basketball Association after absorbing teams from the National Basketball League in the fall of 1949. Official NBA publications include the BAA Drafts as part of the NBA's draft history. The National Basketball Association Most Valuable Player Award (MVP) is an annual National Basketball Association (NBA) award given since the 1955–56 season to the best performing player of the regular season. The winner receives the Maurice Podoloff Trophy, which is named in honor of the first commissioner (then president) of the NBA, who served from 1946 until 1963. Until the 1979–80 season, the MVP was selected by a vote of NBA players. Since the 1980–81 season, the award is decided by a panel of sportswriters and broadcasters throughout the United States and Canada. Each member of the voting panel casts a vote for first to fifth place selections. Each first-place vote is worth 10 points; each second-place vote is worth seven; each third-place vote is worth five, fourth-place is worth three and fifth-place is worth one. Starting from 2010, one ballot was cast by fans through online voting. The player with the highest point total wins the award. As of June 2018, the current holder of the award is James Harden of the Houston Rockets. Every player who has won this award and has been eligible for the Naismith Memorial Basketball Hall of Fame has been inducted. Kareem Abdul-Jabbar won the award a record six times. He is also the only player to win the award despite his team not making the playoffs back in the 1975–76 season. Both Bill Russell and Michael Jordan won the award five times, while Wilt Chamberlain and LeBron James won the award four times. Russell and James are the only players to have won the award four times in five seasons. Moses Malone, Larry Bird and Magic Johnson each won the award three times, while Bob Pettit, Karl Malone, Tim Duncan, Steve Nash and Stephen Curry have each won it twice. Only two rookies have won the award: Chamberlain in the 1959–60 season and Wes Unseld in the 1968–69 season. Hakeem Olajuwon of Nigeria, Duncan of the U.S. Virgin Islands, Nash of Canada and Dirk Nowitzki of Germany are the only MVP winners considered "international players" by the NBA.Curry in 2015–16 is the only player to have won the award unanimously. Shaquille O'Neal in 1999–2000 and James in 2012–13 are the only two players to have fallen one vote shy of a unanimous selection, both receiving 120 of 121 votes. Since the 1975–76 season, only two players have been named MVP for a season in which their team failed to win at least 50 regular-season games—Moses Malone (twice, 1978–79 and 1981–82) and Russell Westbrook (2016–17). There is no prototypical position from which a player may get many steals. While smaller, quicker guards tend to accumulate the most steals, there are many exceptions. For example, forward Rick Barry led the NBA in steals in 1974-75, and for many years center Hakeem Olajuwon led his team in the category, consistently ranking among the league's leaders, and is the only center ranked in the top 10 all-time in steals. Karl Malone, a power forward, is currently number ten.